Kin Felipe VI of Spain received in his residency, the Palace of Zarzuela, the Cuban Minister of Foreign Affairs Bruno Rodríguez, who is on an official visit to Spain. 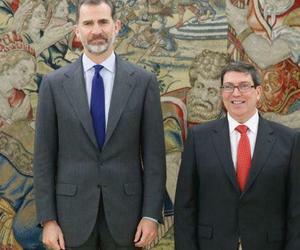 During the meeting the King and the Cuban top diplomat recalled the historical cultural and family bonds between the two countries, reported the Cuban Ambassador to Madrid Eugenio Martínez in his Facebook account. Minister Rodriguez thanked Felipe for his father´s presence during the funeral rites of Cuban Revolution leader. Felipe was accompanied by the Spanish Foreign Minister Alfonso Dastis Quecedo, and other diplomats. The Cuban Minister started a two-day official visit and later was received by the Spanish President Mariano Rajoy at the headquarters of the government, La Moncloa. Later, he will visit Portugal and Greece.